Okay, when you think of people from the Bible, whose name comes to mind first? Jesus, the Son of God? Moses, who delivered Egypt with Divine help? David, who slew Goliath and ended up becoming King of Israel? The Apostle Paul, whose writings make up a good part of the New Testament? If I were to guess, I would say that not many of you would think of Lydia, the first century merchant of fine purple cloth. Still, her story must be important, or else God would not have saw fit to mention her in the book of Acts. 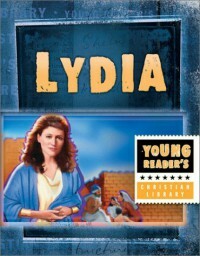 When I saw this at a local used bookstore, I picked it up immediately, because not only do I love most Christian fiction, I also have a friend named Lydia. What did I think of it? It was actually quite good for a kids' book. As is usual for this series, it was a bit heavy on the illustrations, but that probably makes it more accessible to its intended audience. If you have a young fan of Biblical stories in your house, or you enjoy reading kiddie literature, this is a great find.